There are several factors that drive organizations to consider implementing green supply chain (GSC) initiatives. This paper refines an instrument to empirically test the significance of the following drivers for participation in GSC initiatives: Government Regulation, Buyer/Supply Chain Influence, Internal Readiness, Competitive Advantage, and Corporate Social Responsibility. 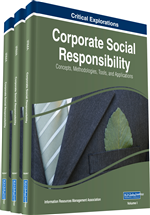 Corporate Social Responsibility emerged as the most significant variable that effected the decision making of the organizations around green supply chain management practices. Surprisingly, Competitive Advantage, which has been found to be a significant contributor in prior research when studied in isolation, did not emerge as a significant factor in this study. The emergent high correlation between the Corporate Social Responsibility and Competitive Advantage could imply that the Competitive Advantage could be embedded within the Corporate Social Responsibility when agencies focus on greening their supply chains. Over time standards and agreed upon methods have been adopted to help businesses recognize various steps they need to take and areas of practice to review. Sarkis (2003) identified 5 primary areas on how businesses deal with waste generated by their supply chain: reduction, reuse, remanufacturing, recycling, and disposal alternatives. Reduction can be attained through placing conscious efforts in the design phase as well as through improvements in supply chain efficiency, such as just-in-time program for inventory (Sarkis, 2003). The remaining four areas of focus deal with the chain’s byproducts and varying organizational processes and technology that are needed to attain sustainability (Sarkis, 2003). How an organization approaches these areas will have an impact on what business processes they may need to change or introduce.